It is the age-old question in the IT world: “why should I upgrade to Y when X works perfectly well?” In this article I will give you my top five reasons why I think you should upgrade to Windows Server 2012 R2 (WS2012 R2). By the way, I am limiting myself to five reasons; if you buy me beer, I could probably talk your ear off on this topic! Microsoft CEO Satya Nadella said at the 2014 Worldwide Partner Conference that there are approximately 22 million installations of Windows Server 2003 and Windows Server 2003 R2 running in the wild. In some markets, up to 50% of servers are still running this 11-year-old server operating system. The support from Microsoft for Windows Server 2003 and R2 is ending on July 14, 2015. That’s just 10 months from now. You have that short of a period to plan, evaluate and migrate your applications and data off of the legacy server OS before Microsoft stops its support. That means no more security fixes on Patch Tuesday, leaving you vulnerable and probably facing compliance issues regarding regulations, such as Payment Card Industry Data Security Standard (PCI DSS) for credit card payment handling. Microsoft will not be extending the deadline to upgrade Windows Server 2003 and R2. This is just like the deadline for XP. It’s a hard date in time that is inflexible. Microsoft currently supports Windows Server 2008, Windows Server 2008 R2, Windows Server 2012, and Windows Server 2012 R2. Windows Server ‘Threshold’ is expected to be released in April 2015, and Microsoft is also supporting Azure, which is based on Windows Server. They cannot afford the resources to be managing a server OS from yesteryear! Your options are limited. You can give Microsoft millions of dollars for a year of custom engineering support. You won’t get legitimate support from hardware or software vendors. In effect, running Windows Server 2003 beyond the end of the lifecycle will be a business risk. Therefore it makes sense to migrate your applications and data to Windows Server 2012 R2. Why not upgrade to an older operating system? You could upgrade x86 Windows Server 2003 installs to Windows Server 2008, which might give you extended support until 2020, but mainstream support will end on January 13, 2015. Also, Windows Server 2008 is not supported by Microsoft Azure. If you are going to spend time on an upgrade project, then it makes sense to jump to the latest OS that offers a more secure and stable 64-bit platform. So why not wait until the release of Windows Server vNext? That version probably won’t be finished until April, and it won’t be generally available for another month or more! Do you want to leave yourself from May until July to perform a complex migration, and do so to a brand new OS that will probably have driver and firmware issues? That’s another risk, so please do the sensible thing and go to the stable Windows Server 2012 R2. It is reported that maybe 53% of the 22,000,000 Windows Server 2003 servers are physical installations. I have read reports that up to 50% of data center servers are still physical deployments. Although some of those machines might have legitimate reasons not to be running as virtual machines, one can assume that many were overlooked when virtualization projects were planned and executed. This might have been to avoid the risks of V2V or to just ‘finish’ the project. If you have to migrate applications and data from a legacy OS, then this gives you the perfect opportunity to run those workloads in virtual machines. The most cost effective way to license Windows for any virtualization platform with dense VM:host ratios is to purchase a datacenter license for the host and use the free virtualization rights to install Windows in the guests with down-level version rights. Good news everybody! If you buy the latest OS for the host, then you can enable Hyper-V, Microsoft’s enterprise virtualization, for free, which is also available as the free Hyper-V Server. Don’t judge Hyper-V by what you might have seen in Windows Server 2008 or R2 — things have changed quite a bit! You don’t need to purchase another virtualization product because you can save money on licensing, power, hardware and support by adopting virtualization and avoid the additional costs of virtualization by staying with Microsoft’s free platform. Remote Desktop Services (RDS): RDS is much more than a system requirement for a Citrix product now. It is based on RemoteFX, a designed-for-the-Internet/WAN remote desktop protocol that now has clients for Windows, Mac OS, Android, and iOS. Workplace Join: Similar in concept to a domain join, this allows users to register their profile and device combination in the domain and allows them to authenticate against domain resources from a non-corporate and non-Windows device. Web Application Proxy: This is a mechanism to allow users to securely authenticate and authorize against the domain from devices outside of the edge network. Work Folders: Users can synchronize folders from on-premise file servers to their Windows 8.1 devices. IT has the ability to remotely and selectively wipe the folders from a user’s PC, in case it is lost or the employee leaves the company with their personal device. In other words, Windows Server 2012 R2 gives you the means to enable staff to work from anywhere on any device, but within the supervisory umbrella of IT. Not matter whether you’re running Windows Server Essentials on a single micro-server for 10 users or you have a data center with a thousand Hyper-V hosts, Windows Server 2012 R2 is the best OS to use when working in a hybrid cloud scenario. Microsoft’s public cloud, Windows Azure, is based on Windows Server Hyper-V. You will always have the best features available when you run the latest operating system and continue to have service integration possibilities when you run a recent OS. Note that Windows Server 2008 is not supported by Azure, even for hybrid services, such as online backup. There are also performance features to consider. Microsoft has improved the performance of TCP/IP with each release of Windows Server. The latent connections, be they VPN or WAN, between on-premises locations and a public cloud need to be accounted for. 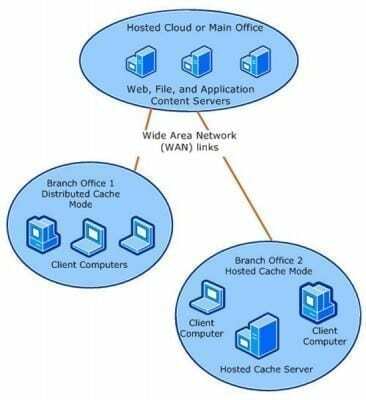 For example, features that BranchCache provides offers much better performance for web and file services that are in remote locations and can be used to economically reduce the noticeability that services have been moved off-premises. Of course, if you are one of those hosting partners, then you really should look at Hyper-V. You’ll have the ability to partner with Microsoft in offering a single cloud OS to your customers, leveraging features such as network virtualization, and be able to offer your services to customers using a consistent UI experience via the Windows Azure Pack. Two years ago I did a roadshow with Microsoft Ireland to encourage companies to upgrade from Windows Server 2003 to Windows Sever 2012. We included features that had been introduced in Windows Server 2008/R2 and had been improved in Windows Server 2012. I was amazed that no one had heard of these features, especially because these were features that customers had begged for. Some features that come to mind are Active Directory Recycle Bin and fine-grained password policies within a domain. Microsoft has not stopped there. Failover clustering has traditionally been a week-long project and is now simple, where it’s also included in the standard edition. The 80/20 rule of DHCP has been dispensed thanks to new high availability features. IIS is scalable and offers great performance for non-Microsoft platforms such as PHP. Storage costs have plummeted with the addition of Storage Spaces. And you can increase security in physically insecure locations using BitLocker encryption. Have a few reasons of your own why admin should upgrade to Windows Server 2012 R2? Or perhaps some reasons why they shouldn’t? Add a comment at the end of this blog post. Aidan Finn writes about Microsoft virtualization for the Petri IT Knowledgebase. He is a Microsoft Valuable Professional with the Virtual Machine (Hyper-V) expertise. Aidan has been working in IT infrastructure since 1996, and is the Technical Sales Lead for MicroWarehouse Ltd., a Microsoft value added distributor in Ireland. He runs the aidanfinn.com blog and has written or co-written books such as Windows Server 2012 Hyper-V Installation And Configuration Guide, Microsoft Private Cloud Computing, and Mastering Hyper-V Deployment.